Drive down Dayville Road approximately 4.5 miles from the Richardson Highway. Park in the plowed pullout on the South side of the road - this is the Solomon Gulch hiking trailhead. Go up the well used path to the pipeline. Hang a right, go approximately 100 yards, then head southish along the trail toward Benzene. After a couple hundred yards the area opens up a bit - aim for the creek drainage slightly to your right across the clearing. Follow this into the Benzene bowl area, and gradually contour around toward the notch at 12xx'. The red line below approximates the skin track. The savvy skinner in adequate snow can make it to this notch with no switchbacks. If you make more than one Z, you should probably contemplate suicide, or at the very least question your worth as a human being. The section between the pipeline and the bowl is cumbersome in low snow. 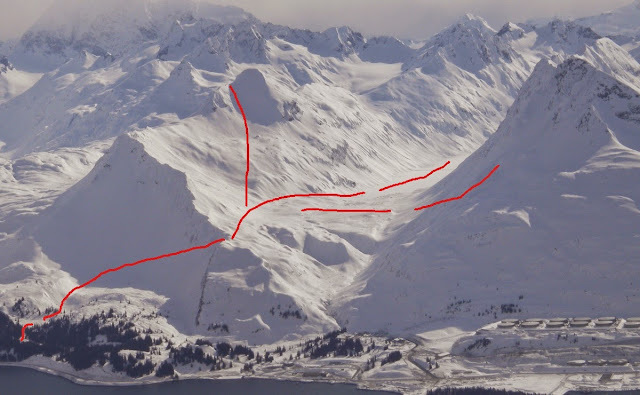 The topo below shows up routes in red, and some of the ski lines in green. Click on the links below the topo for more specifics on each route. As you will notice once you're in the neighborhood, there are other options not detailed here. This view shows the approximate skin tracks getting into Allison Creek drainage and starting towards the various options listed above.